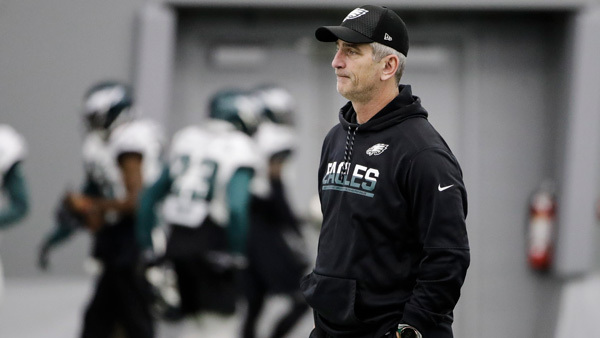 Frank Reich has emerged as the favorite to become the new head coach of the Indianapolis Colts, who are hoping to hire the Philadelphia Eagles offensive coordinator once they have negotiated a signed, sealed and delivered contract, league sources told ESPN. Colts general manager Chris Ballard finished an intensive round of interviews Saturday with Buffalo Bills defensive coordinator Leslie Frazier. Reich was interviewed Friday, and New Orleans Saints assistant head coach/tight ends coach Dan Campbell was interviewed Thursday. The Colts renewed their search for a coach when New England Patriots offensive coordinator Josh McDaniels backed out of an agreement in principle after the team announced Tuesday that he would be introduced at a news conference Wednesday. Instead, Ballard was left to explain the circumstances in which McDaniels reneged on a deal and acknowledged there was no signed agreement. The Vikings have their new offensive coordinator. Nevertheless, the Colts this time are hoping to hire Reich, the winning Super Bowl offensive coordinator, after McDaniels, the losing coordinator, reversed course to remain with the Patriots. Neither Ballard nor the team had any comment Sunday on the latest development. No announcement will be made until after a contract is fully executed with a new coach, a source said. Furthermore, the Colts will be in Atlanta on Monday to pay their respects to Edwin Jackson, the 26-year-old linebacker who was killed in a car accident Feb. 4, along with his Uber driver, when they were struck by a car operated by a drunken driver. The Eagles have braced themselves to lose Reich to the Colts. Reich, 56, received strong, detailed endorsements, but Ballard nevertheless engaged in an interview that lasted approximately 10 hours, sources said. Frazier and Campbell had thorough interviews as well, but Reich's experience on the offensive side of the football was considered an advantage. Nick Foles owns the Patriots, Google says. Nydia Han reports during Action News Mornings on February 11, 2018. Reich, a former quarterback, began his coaching career in 2006 as an intern with the Colts and eventually was promoted to coach the quarterbacks and wide receivers until 2012, when he left to become the wide receivers coach for the Arizona Cardinals for one year. In 2013 he was hired by the San Diego Chargers as their quarterbacks coach and became the team's offensive coordinator the following year, before joining the Eagles in 2016.